The catalogue for the 2013 edition of Australasia’s most prestigious thoroughbred auction, the Inglis Australian Easter Yearling Sale is now available online at www.inglis.com.au and on the Inglis Sales iPad App. Featuring 569 of the finest bred and conformed yearlings from the region’s leading breeders, the 2013 Easter Sale will be conducted at Inglis’ Newmarket Complex in Sydney on 9, 10 and 11 April, between the Australian Turf Club’s Golden Slipper and Derby weekends. Again there has been no compromising on pedigree or type accepted into this year’s catalogue, which features substantial representation by all the leading sires, tremendous female family depth and outstanding athletes. Fastnet Rock’s progeny have taken all before them on the racetrack, such as Easter Group 1 winning graduates Foxwedge, Wanted and Mosheen. Coolmore Stud’s champion sire is represented by 51 yearlings in the 2013 Easter Sale catalogue. Coolmore barnmates High Chaparral and Encosta de Lago have 38 and 18 yearlings respectively in the April catalogue. Arrowfield Stud’s two champion sires Redoute’s Choice and Flying Spur are represented with 35 and 21 entries respectively, while fellow proven stars Charge Forward (8 lots), Snitzel (20) and Starcraft (12) also have strong drafts. Easter graduate Samaready proved herself a remarkable juvenile last season when taking out the Blue Diamond Stakes. Her Vinery Stud based sire More Than Ready has 31 yearlings set to be offered at Easter. Other leading sires with strong representations include Bernardini (8), Commands (8), Exceed And Excel (9), Lonhro (24), O’Reilly (10), Pins (7), Shamardal (15), Stratum (12), Street Cry (15), Testa Rossa (8) and Zabeel (12). Brilliant Easter Sale graduates Wanted (6), Von Costa de Hero (1), and Onemorenomore (15) all have their first crop of yearlings featuring in the 2013 Easter catalogue. Other first season sires represented are All American (5), Big Brown (7), Denman (10), Duporth (13), I Am Invincible (2), Manhattan Rain (22), Mastercraftsman (2), Medaglia D’Oro (14) and Nicconi (8). “Easter is an integral part of the famous Sydney Carnival and the team here at Inglis are certainly looking forward to April and the offering of another fantastic selection of yearlings, such as Black Caviar and All Too Hard’s half-brother,” said Inglis Managing Director Mark Webster. To be offered as Lot 131 the Redoute’s Choice x Helsinge colt is one of 162 siblings to stakes winners in the Easter catalogue. “The Helsinge colt is no doubt the most anticipated colt in Australasia’s thoroughbred auction history, a sibling to a Three-time World Champion Sprinter in Black Caviar and the equal World Champion Three-Year-Old miler in All Too Hard, which topped the sale himself in 2011,” Webster said. A three-quarter brother to Mosheen, the 2012 World Champion 3YO Filly Miler, is also amongst the 42 siblings to Group 1 winners set to be offered on 9, 10 and 11 April. 202 of the yearlings catalogued across Session One and Session Two for 2013 Easter are from stakes winning mares, 46 of those won at Group 1 level such as champions Makybe Diva, Samantha Miss and Sun Classique. “Exceptional stallion and mare strength was again a feature of the entries we received for this year’s Easter Sale and the tremendous types presented to us in the field by all the leading breeders certainly made it enjoyable to compile this catalogue,” said Inglis Bloodstock Director Jonathan D’Arcy. There is over 200 years of bloodstock experience in Inglis’ yearling selection team, so it really should not come as a surprise that Group 1 winners can be purchased across all buying levels at the Easter Sale. Caulfield Guineas winner and recent Vinery Stud stallion acquisition All Too Hard topped the 2011 Easter Sale when selling for A$1,0250,000, while Fat Al, which gave Gai Waterhouse her seventh Group 1 Epsom Handicap, was purchased at Easter for just $27,000. “The ability to buy a top quality racing prospect with considerable residual value across all buying levels is a real hallmark of both Session One and Session Two at the Easter Sale. “Buyers with budgets of less than $50,000 to more than $1 million can aim higher when they purchase an Easter yearling and we welcome everyone to the 2013 sale this April,” D’Arcy adds. 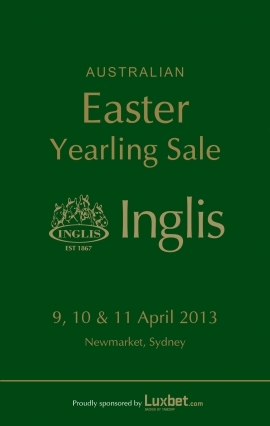 The catalogue the 2013 Inglis Australian Easter Yearling Sale can be viewed online at www.inglis.com.au and downloaded on the Inglis Sales iPad App. Hard copy catalogues will be mailed next week.